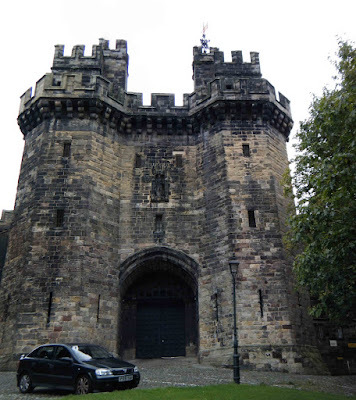 I've taken a few more photos of Lancaster and decided to post them here for you, especially seeing as how popular the Lancaster Castle pages seem to be. Lancaster Castle has been used as a prison since 1745, but in in 2010, it was announced that it would cease to be used as an HMP. Hopefully at some point in the future, the castle will be opened up to the public and it will be possible to take photographs of the interior of the building. Above. At last....nearly the perfect photo of the John of Gaunt built gatehouse. The gatehouse was built on the command of Henry IV, as part of an extensive rebuilding of the castle. The twin towers of the gatehouse would have made it one of the most impregnable of its type in its day, incorporating new defensive features that would have been regarded as 'cutting edge' defensive qualities. It is possibly one of the most complete gatehouses of its age in the whole of the UK. Above. The Well Tower or Witch's Tower. The Well Tower, also known as the Witch's Tower, was probably built around 1325. It originally contained two wells and stone vaulted cellars, indicating that the tower would have been a self-sufficient part of the castle in the event of the walls being breached....almost a second but smaller keep. Above. The Keep, visible above the walls from across the church yard. 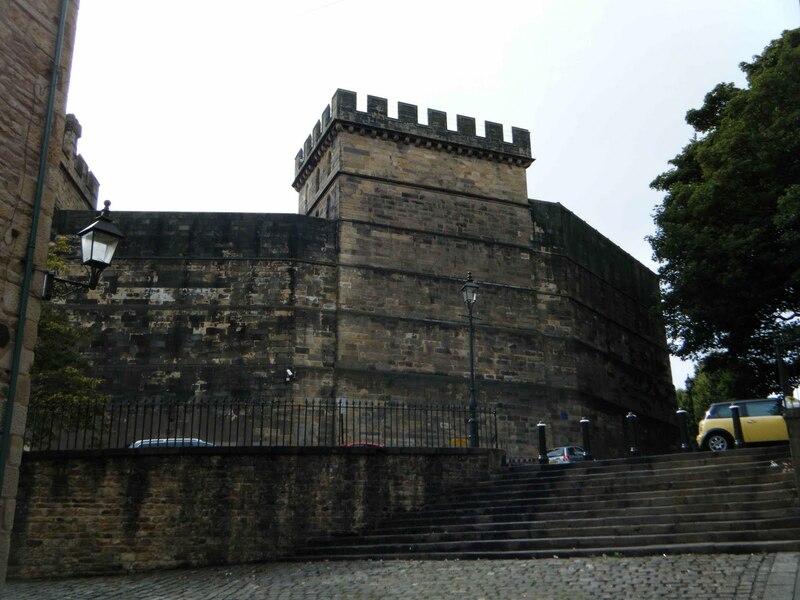 The Keep is the largest building of the castle at Lancaster, and dates to the 12th century. It was largely rebuilt during Elizabeth the I's reign. The tower stands 20 metres tall, with walls somewhere around 3 metres thick at their base. Internally, each of the four storeys are divided by a single wall, so that each floor contains two rooms. 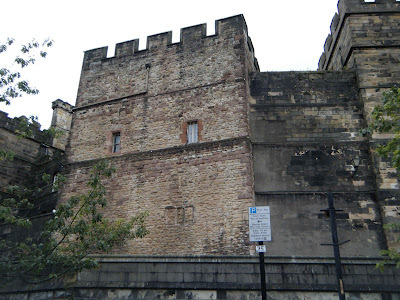 The tower is also known in historical documents as the Lungess Tower. The Shire Hall was built towards the end of the 18th century, to designs by Thomas Harrison. The hall is ten sided, and houses the courtroom. Records show that a shortage of money prevented the hall from being completed until Joseph Gandy 'stumped' up the remainder of the funds in 1802. Above. One of the more recent (1800s) towers. 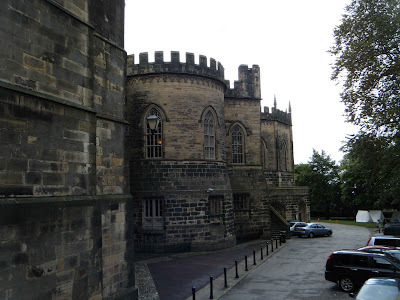 Lancaster Castle was heavily rebuilt and modified towards the end of the 18th century. Some of the medieval curtain walls and some of the towers were demolished during this period to enable the castle's footprint to be slightly increased, making better use of the space to house further buildings. Between 1794 and 1796, an all male prison was built over the demolished curtain wall, and at this time, an 'attractive' debtors prison was built, overlooking parkland. In 1796, as part of this period of rebuilding, the medieval hall was demolished to make way for the new Crown Court. The medieval vaults still survive and can be seen when taking the castle tour. A huge all female prison was built in 1821, representing the last major rebuilding of Lancaster Castle. 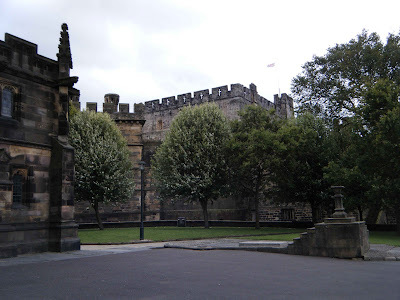 As soon as I have some more information regarding the future of Lancaster Castle, I'll post it here.